What to do and how we can help! 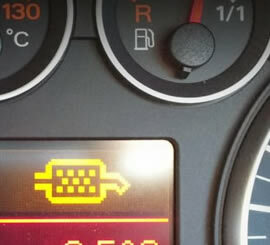 It is normal for the DPF warning light to illuminate if the ECU detects a blockage. If the dashboard DPF warning light illuminates while the performance of the vehicle appears normal this generally indicates that you need to manually regenerate the filter. Please visit our DPF fault codes page for DPF-related codes for many popular vehicle makes and models. If the ECU detects that the filter is fully blocked it will not allow the regeneration process to proceed for safety reasons (there is a risk of the soot catching fire). At this point the DPF warning light on the dashboard will come on and the car will go into 'limp' mode to prevent further damage. At this point you may be advised by your main car dealer that the DPF cannot be cleaned and that the only solution is to replace it with a new unit. The cost for removing the old filter and installing a replacement can range from �0 to �00 depending on the make and model of the vehicle. We are able to clean the DPF filter using specially developed procedures and chemicals for a fraction of the replacement cost. Your DPF can be collected, professionally cleaned and returned within 48 hours. Alternatively customers are welcome to visit us in person at our Greater Manchester workshop. Book an appointment today by calling us or by completing our online enquiry form.